Why Walk for 24 Hours? 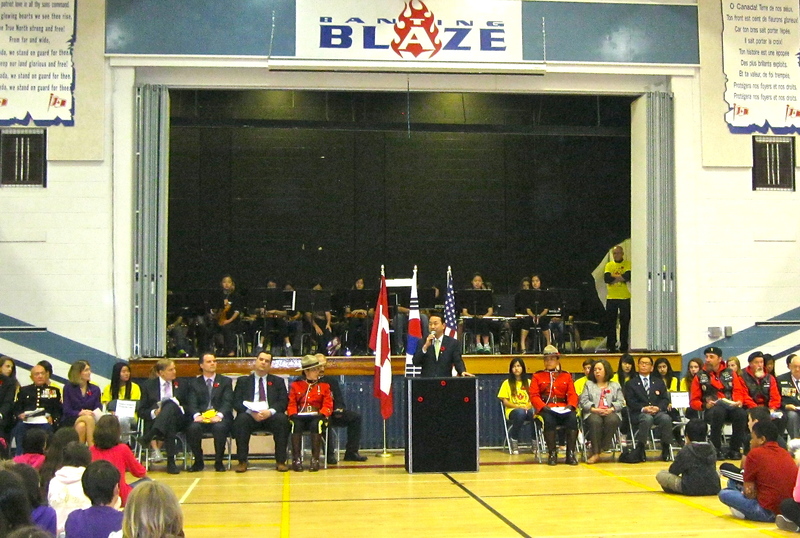 Consul General Yeon-Ho Choi of the Republic of Korea addresses students and members of the public at Banting Middle School in Coquitlam to commemorate the 60th Anniversary of the Korean War Armistice. Some people do impactful and altruistic deeds without any obvious expectation of benefit. Guy Black is one of these people. On June 22nd Guy completed a 72 kilometre walk in 24 hours in order to bring attention to people and issues he believes deserve more attention. Guy has been an advocate for veterans and remembrance for 16 years, and the two-day 60th Anniversary Korean War Peace Celebration drew attention to this “Forgotten War” and all of those connected to it. On schedule, at 11am on Sunday, June 22nd, Guy Black and an entourage arrived at Burnaby Central Park where the Ambassador of Peace Monument stands to commemorate Korean War veterans and where Korean Consul General Yeon-Ho Choi received numerous sacred stones as a gift to bring to South Korea. Two years of preparation and planning had paid off. The event was more than a walk; it was an epic adventure with deep roots in humility, culture, community outreach and history. With a number of others, Mr. Black spent countless hours organizing. From an onlooker’s perspective, the stars simply aligned to make the event one that was destined to occur. VIPs and Dignitaries attending the Banting Middle School peace event. and Port Moody, who supported the walking event, happened to have attended Banting Middle School, the same Coquitlam school which Mr. Black’s sons attend. Finally, an astounding number of VIPs, dignitaries, and Korean War veterans were available to sync their schedules to attend the hour-long opening peace ceremony. The purpose of the event as outlined in the detailed event program was one “to remember the Korean War, and its tragic cost, and [to] celebrate 60 years of relative peace and especially celebrate our veterans.” The Korean War began in 1950 and ended three years later, with United Nations peacekeeping efforts continuing until 1955. Many nations’ soldiers took part. Canada’s forces, the third largest contingent, consisted of about 27 000 volunteer men and women, and in the end cost over 500 Canadian lives including 36 British Columbians. Mr. Sonny Son, the Past President of the Korean War Veterans Association Western Canada Chapter, expressed the purpose of the event from his perspective. “We are looking for peace, and that’s why we are doing the ceremony…At the same time, the Korean people…are thankful for the Canadian people who supported us in the war. So [it] is not only remembering, it is walking for peace.” Mr. Son believes that remembering the past is important because it is the foundation of Canadian society, especially considering that “people are forgetting about the [Korean War]”. Mr. Guy Black receiving a blessing for stones presented. 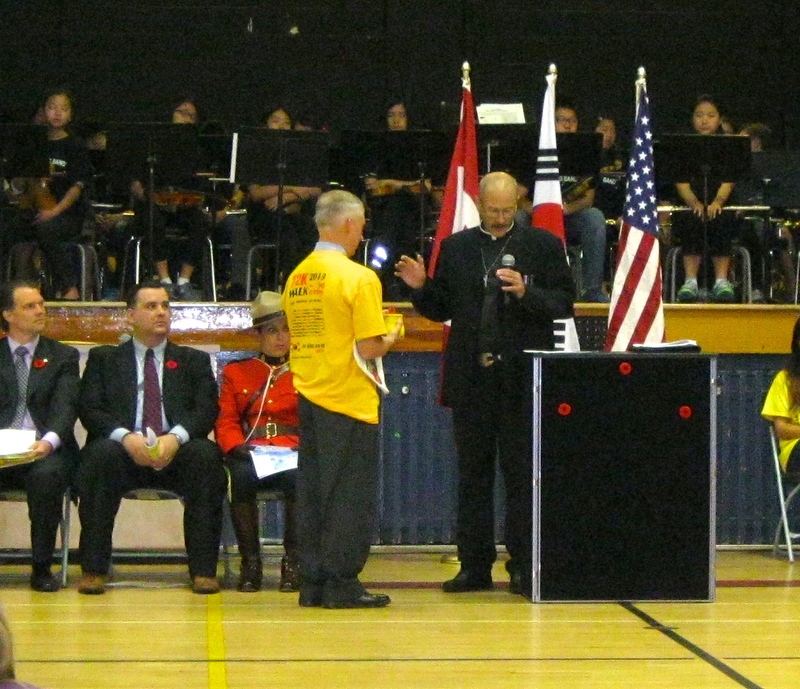 The event began with the school peace ceremony held at Banting Middle School in Coquitlam, a formal ceremony taking place between the traditional “Oh Canada” and “God Save the Queen”, and including the national anthems of both South Korea and the United States. Not one, but five dignitaries addressed the audience of 600 students, and members of the public. The Honourable James Moore, PC, MP; Fin Donnelly, MP; General Yeon-Ho Choi of the Republic of Korea Consul, the United States Consul General Anne Callaghan and Mr. Warren Byrnell, President of the Korea Veterans Association of Canada, Maple Ridge/Pitt Meadows Unit delivered strong messages of support for veterans and for peace, in that order. 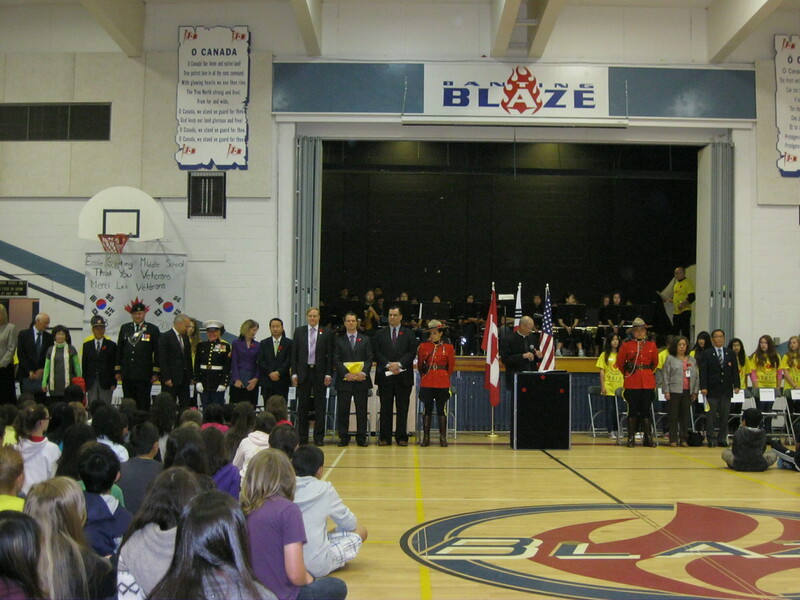 Many other important federal, provincial, and school officials also attended. Guy Black, MPs Peter Julian and Fin Donnelly set out with supporters on 72km walk. 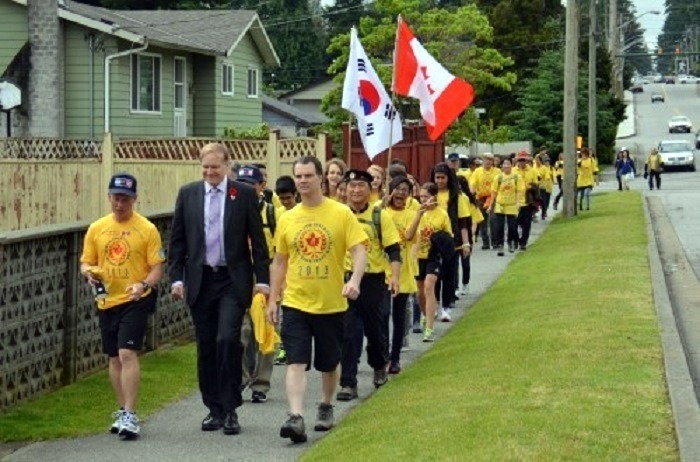 The opening peace ceremony represented only the beginning of the grueling 72 kilometre walk over a period of 24 hours, which covered ground from Coquitlam to Simon Fraser University, to Mount Seymour, and finally to Burnaby Central Park. Stones from significant and meaningful places were carried which represented traditions occurring during the Korean War. The more mountainous terrain chosen for the walk was meant to create an opportunity for Guy and other walkers to feel some of the pain and endure some hardships actual soldiers had gone through. With his quiet, determined persona, Guy Black arranged an event which placed others in the spotlight, while he remained the driving force behind it. This is the way Mr. Black’s 16 year advocacy has worked, placing war veterans at the forefront while he works behind the scenes. In a letter to event organizers, the Ambassador of the Republic of Korea to Canada, His Excellency Cho Hee-yong stated his certainty “that this event will help our younger generation understand the tremendous service and immeasurable sacrifices made by Canada’s veterans”. The event showcased the ability of Banting students to take the lead, and most definitely they will take away a deeper understanding of both war and peace. Furthermore, the “deepest gratitude” expressed by Consul General Choi in his speech to Canadians for their support of Korea was welcomed with the serious attention and concentration of all of the students in the audience. Banting Middle School students give gifts to Korean War Veterans. The 60th Anniversary Korean War Peace Celebration event demonstrated the strength of community, the beautiful and humble Korean culture, youth’s desire to make meaningful contributions, and the complexity of the Korean War era. Guy will continue to advocate and continue to dream of visiting Korea, its battlefields and memorial sites. And you will see more of Guy Black’s work, you can be sure of it.